When the R.A.T.S. 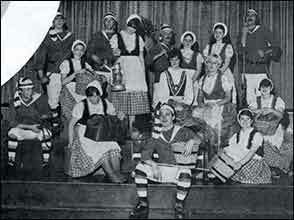 presented their first panto ‘Babes in the Wood’ it was produced by Arnold Peters. 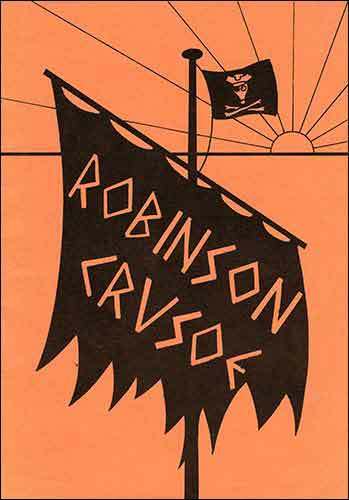 For this our 20th panto, ‘Robinson Crusoe’ we are delighted to welcome him back again. A member of the B.B.C. 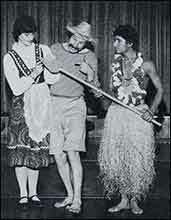 Drama Repertory Company, Arnold has broadcast on over 2,500 occasions. Currently he portrays the character of Jack Wooley in ‘the Archers’. He has written, directed and appeared in many pantomimes; he has toured with ‘My Fair Lady’; his films include ‘A Man for all Seasons’, ‘Cromwell’ and Walt Disney’s ‘Diamonds on Wheels’. You may have seen him on television in ‘Duchess of Duke Street’, ‘Citizen Smith’, ‘Porridge’, ‘It Ain’t ’Arf Hot Mum’, ‘War and Peace’ among many others. He has recently appeared in ‘Angels’ and ‘To the Manor Born’ and has just filmed scenes for the new series of ‘Last of the Summer Wine’. So you see we have a producer of wide experience. Our Musical Director this year is David Gomm. David has played in the R.A.T.S. orchestra for many years hidden from view, now you have the opportunity to see him as he conducts the orchestra. Since David lives in London we have created a new position this year; we welcome Geof Gilpin as our Chorus Master. We are sure that, as you listen to the music, you will appreciate their hard work. Once again Robina cooper is our Choreographer; no panto would be the same without its dancing girls. 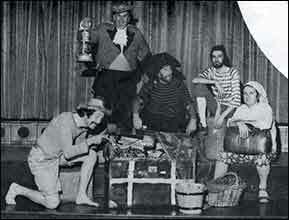 But without the many R.A.T.S., both on stage and behind the scenes, we could not present ‘Robinson Crusoe’, and without you, our audience, it would not be worthwhile; so we welcome you all. We trust you will enjoy the panto and tell your friends. Our story opens in the port of Hull as sailors prepared the good ship Venturer; ready to sail the seven seas seeking fame and fortune. The Master of the ship, our hero Robinson Crusoe, is saying his fond farewells to pretty Polly Perkins. Atkins, better known to the landed gentry as Sir William, but to all good seafaring folk as Will Atkins the pirate, is plotting dastardly deeds with the Bosun and the Mate. Mother Crusoe, landlady of the Mucky Duck, is looking for a man as usual, a real man, whilst her younger son, Billy, spends his time playing the fool or trying to chat up Jill a local beauty. Aboard the Venturer there is a treasure map pointing the way to untold wealth. Whose is it? Who’s got it? Who wants it? Who’s going to have it? Before we can find out the answers to these questions the wind blows, the sea swells, the tempest rages and soon they are all on their way to Davy Jones’ locker. 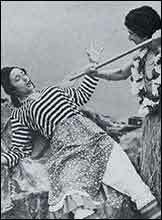 Shipwrecked on a desert island Robinson befriends a frightened native whom he calls Man Friday. Here he finds the treasure, defeats Atkins and saves all his friends from the cannibal cook pot. 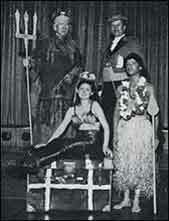 Rescued by the Royal Navy they all return to Hull to live happily ever after. David Coleman, Gareth Evans, Merve Goddard, Maria Grimmett, Susan Keech, Sarah Keegan, Carol Malins, Lisa Nicholson, Clare O'Brien, Doug Pateman, Jon Sidey, Wendy Stott, Ann Wilmer, Andrew Windatt, Lesley Young. Sarah Cross, Nicola Dellar, Stacy Fillingham, Gail Holland, Lisa Hemmington, Lucianne Mayes, Sarah Pott, Debbie Ryan, Kaye Smith, Wendy Smith, Diane Straw, Amanda Wilkins. Charis Butler, Hilary Challen, Emma Dicks, Polly Hope, Catherine Matthias, Carin Neville, Krista Neville, Tammy McLaren, Alexandra Pope, Victoria Pope, Francis Pow, Nicola Sanderson, Karen Taylor, Samantha Tomlin, Carol Wadsworth, Elizabeth Walker, Rebecca Waterman, Sarah Whiting, Karen Woolhouse, Martine Woolhouse. Simon Baker, Jemma O'Brien, Alison Bolton, Julie Nash, Lisa Pettit, Kate Rawlins, Jayne Short, Sarah Tofield, Tracey Tofield, Joanne Tew, Lisa Wilson, Sally Wood, (Members of the New Experience). The Directors, Management and staff of the Ritz for their help. The East Northamptonshire Co-operative Society for use of premises. Miss Cherry and John Childs for rehearsal rooms at Higham Ferrers Infants School. The Windmill Club, Higham Ferrers Adult School, The Victoria Hotel, The Hamlyn Publishing Group and Mencap Y.C. for use of rooms. The St. John Ambulance Brigade for their attendance at the Ritz. 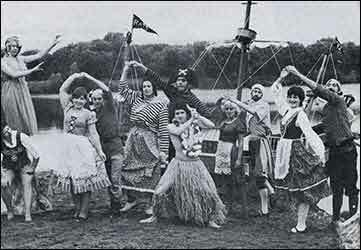 Skew Bridge Ski Club, The Anglia Building Society and Bernard A. Potter (Insurance) Ltd. for use of premises for publicity. Frank Langley, C. Howe, P. Marshall and Whitworth Holdings for transport. 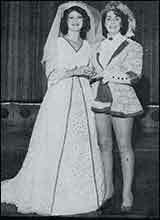 The Evening Telegraph for publicity. Frank Phypers and Fred Page for artwork. P & C Engineers for properties. Robert Marriott Ltd; Ellis and Everard Ltd.
Paul Mundy of Walter Knight Ltd. for poster. Arca Press for this programme. To all our many friends, who have not been named, for all their help in this production; Thank You. We were grieved to learn of the deaths of three of the R.A.T.S. family during the past year. 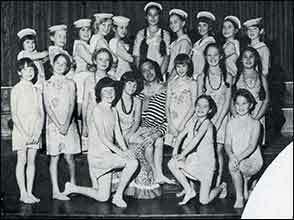 was a member of the back stage staff since our production of Oliver in 1969. His work both behind the scenes and in the workshop has enabled us to stage the panto spectaculars for which Rushden is known. was one of our dressers during panto week. 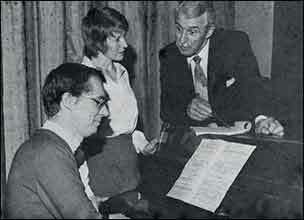 At rehearsals her cups of tea assuaged many a chorus member’s thirst. was always a willing helper in time of need. On occasions when our regular accompanists were absent Janet would always step into the breach. To those left behind the R.A.T.S. family extend their heartfelt sympathy.